Cells specializing particular function is carried out by a cluster of cells at a definite place in the body. This cluster of cells is called as tissues. Blood, phloem and muscle are all examples of tissues. A group of cells that are similar in structure and/or work together to achieve a particular function forms a tissue. Based on the dividing capacity of the tissues, various plant tissues can be classified as meristematic tissue and permanent tissue. Depending on the region where tissues are present, meristematic tissues are classified as apical, lateral and intercalary. 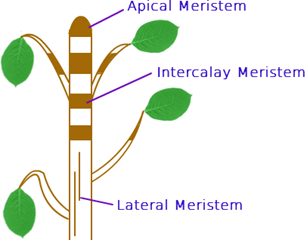 Apical meristem is present at the growing tips of stems and roots and increases the length of the stem and the root. The girth of the stem or root increases due to lateral meristem. The process of taking up a permanent shape, size, and a function is called differentiation. Cells of meristematic tissue differentiate to form different types of permanent tissue. A few layers of cells form the basic packing tissue. This tissue is parenchyma, a type of permanent tissue. It consists of relatively unspecialized cells with thin cell walls. This tissue provides support to plants and also stores food. The parenchyma of stems and roots also stores nutrients and water. 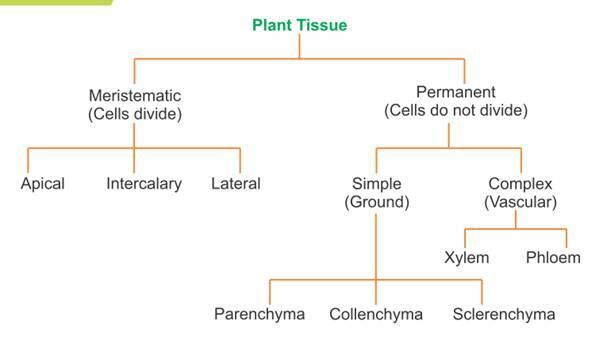 The flexibility in plants is due to another permanent tissue, collenchyma. It allows easy bending in various parts of a plant without breaking. It also provides mechanical support to plants. Yet another type of permanent tissue is sclerenchyma. It is the tissue which makes the plant hard and stiff. The cells of this tissue are dead. They are long and narrow as the walls are thickened due to lignin. The epidermis is usually made of a single layer of cells. The entire surface of a plant has this outer covering of epidermis. It protects all the parts of the plant. Epidermal cells on the aerial parts of the plant often secrete a waxy, water-resistant layer on their outer surface which aids in protection against loss of water, mechanical injury and invasion by parasitic fungi. We can observe small pores here and there in the epidermis of the leaf. These pores are called stomata. Stomata are enclosed by two kidney-shaped cells called guard cells. 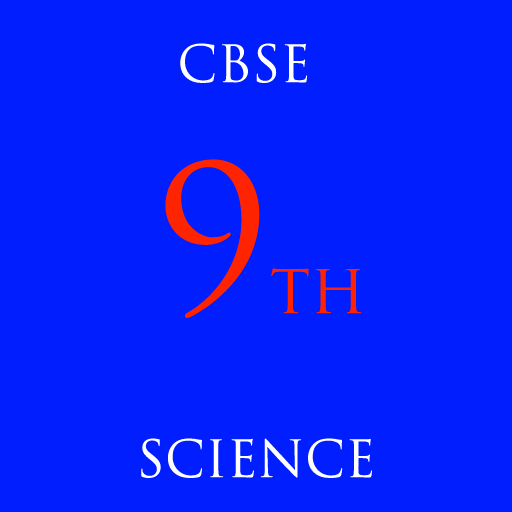 They are necessary for exchanging gases with the atmosphere. Transpiration also takes place through stomata. Epidermal cells of the roots, whose function is water absorption, commonly bear long hair-like parts that greatly increase the total absorptive surface area. Cells of cork have a chemical called suberin in their walls that makes them impervious to gases and water. Xylem consists of tracheids, vessels, xylem parenchyma and xylem fibres. The cells have thick walls, and many of them are dead cells. Tracheids and vessels are tubular structures. This allows them to transport water and minerals vertically. The parenchyma stores food and helps in the sideways conduction of water. Fibres are mainly supportive in function. Phloem is made up of four types of elements sieve tubes, companion cells, phloem fibers and the phloem parenchyma. Sieve tubes are tubular cells with perforated walls. Phloem is unlike xylem in that materials can move in both directions in it. Phloem transports food from leaves to other parts of the plant. For movement of our body parts we have specialized cells called muscle cells. The contraction and relaxation of these cells result in movement. Blood is a type of connective tissue, and muscle forms muscular tissue. It also forms a barrier to keep different body systems separate. The skin, the lining of the mouth, the lining of blood vessels, lung alveoli etc. are all made of epithelial tissue. 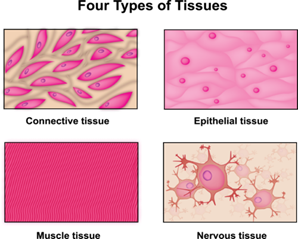 Epithelial tissue cells are tightly packed and form a continuous sheet. The cells of connective tissue are loosely spaced and embedded in an intercellular matrix. The matrix may be jelly like, fluid, dense or rigid. Bone is another example of a connective tissue. Another type of connective tissue is cartilage, has widely spaced cells. Cartilage smoothens bone surfaces at joints and is also present in the nose, ear, trachea and larynx. Areolar connective tissue is found between the skin and muscles, around blood vessels and nerves and in the bone marrow. It fills the space inside the organs, supports internal organs and helps in repair of tissues. Fat storing adipose tissue is found below the skin and between internal organs. The cells of this tissue are filled with fat globules. 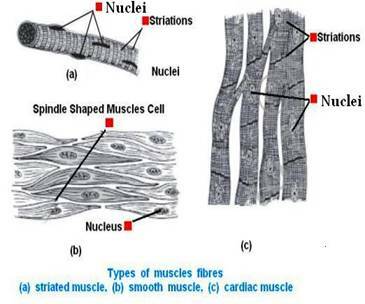 Muscular tissue consists of elongated cells, also called muscle fibers. This tissue is responsible for movement in our body. Muscles contain special proteins called contractile proteins, which contract and relax to cause movement. Muscles present in our limbs move when we want them to, and stop when we so decide. Such muscles are called voluntary muscles. The muscles of the heart show rhythmic contraction and relaxation throughout life. These involuntary muscles are called cardiac muscles. Heart muscle cells are cylindrical, branched and uninucleate. The brain, spinal cord and nerves are all composed of the nervous tissue. The cells of this tissue are called nerve cells or neurons. A neuron consists of a cell body with a nucleus and cytoplasm, from which long thin hair-like parts arise. Each neuron has a single long part, called the axon. And many short, branched parts called dendrites. Many nerve fibres bound together by connective tissue make up a nerve.